Leonid Kadeniuk, the first and only Ukrainian cosmonaut, died in Kyiv on Wednesday at 67. Ukrainian Prime Minister Volodymyr Groysman offered his condolences to Kadeniuk's relatives and loved ones. "Leonid Kadeniuk has died. A truly legendary man. My condolences to his relatives and friends," Groysman wrote on his Facebook page on Wednesday afternoon. The State Space Agency of Ukraine told Interfax that Kadeniuk seems to have died of a heart attack. "According to the information provided by relatives, Leonid Kostioantynovych had a heart attack during his traditional jog in the park on Wednesday morning. He was hospitalized, but the doctors could not save him," the source told the agency. Kadeniuk was born on January 28, 1951 in the village of Klishkivtsi in the Khotynsky district of Chernivtsy region. His parents were village teachers. In 1995, Kadeniuk was selected to become a cosmonaut of the National Space Agency of Ukraine. 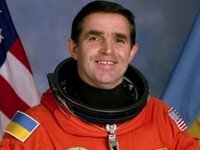 After training at NASA between November 19 and December 5, 1997, he took part in the STS-87 mission of the United States' Space Shuttle Columbia. He performed biological experiments on plants during the flight.